While Construction Materials Engineering and Testing (CMET) firms like Terracon provide both QA and QC services, they are two fundamentally different services. Understanding the differences between these two can lead to clearer communication, and a better understanding of roles and responsibilities by all parties involved, and a better quality project. What are the key differences between Quality Assurance and Quality Control? Quality Assurance (QA) services are used by owners, owner’s representatives (e.g., architects, engineers, and construction managers), and developers to evaluate how likely it is that a contractor is achieving specified conditions. 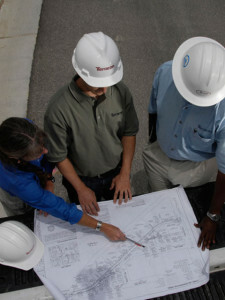 CMET firms like Terracon perform QA services and generate real-time information about the contractor’s performance, which allows the owner to immediately take appropriate steps when CMET reports indicate the likelihood that a contractor’s work is not meeting the requirements of the project specifications. It is important to hire a qualified CMET firm because an unclear QA scope or poorly implemented QA can allow serious shortcomings to go undetected. Worse, these issues may be discovered years after a project is completed, at a time when the owner must bear the cost of repairs. QA typically comprises periodic observation and testing services designed to indicate the degree of diligence contractors are applying to achieve the project specifications. The frequency and extent of the QA observation and testing are determined mostly by owners. In some cases, the owner is not willing to pay for the scope of QA services required by the contract documents and therefore QA is not performed at all. Quality Control (QC) services are used by contractors to ensure their work achieves the designers’ specifications, something which they are contractually required to do. As such, effective QC is not limited to ensuring compliance with specifications using CMET procedures. It also includes activities like qualifying subcontractors, reviewing subcontractors’ bids and submittals, and providing competent jobsite supervision. Clients trust contractors to conduct their own QC, which may include hiring a CMET firm like Terracon. However, unless required by the project documents, contractors may not request comprehensive QC services from independent CMET firms. In addition, in this arrangement, contractors may not be required to submit results, and CMET firms may have contractual requirements that prevent them from providing information directly to the owner and their design team. Regardless of the extent of QA or QC services for a project, the contractor is still required to meet project requirements. The requiring of these services by inclusion in the specifications provides the owner, design team, and contractor a basis to document that the expected quality is being provided. How Can You Ensure You Receive Thorough QA and QC Services? Provide the information CMET consultants need to prepare a reliable proposal. It is important that the CMET firm has a clear understanding of the scope of the project, the specified QA or QC services, and the expectations of the owner and contractor. If you are an authorized representative of the CMET consultant’s client, the client/CMET consultant contract gives you formal authority to rely on a QA or QC report. If you are not an authorized representative, then legal reliance must be granted by the CMET firm. Being on the report distribution list does not imply legal reliance and does not relieve the contractor of his responsibility for meeting the requirements of the project specifications. So, does this mean that there should be two CMET firms on every project, one hired by the owner and one hired by the contractor? Furthermore, does it mean that others cannot depend on the accuracy of the tests and inspections of the owner’s CMET firm? No, but it does mean that the tests and inspections performed by the owner’s CMET firm may not be enough to verify that the contractor has complied with the requirements of the project specifications. It may behoove the contractor to conduct additional testing and inspections to meet project requirements as part of their quality control efforts. Similarly, if the owner is electing to put the sole responsibility quality observation and verification on the contractor, they should first verify that this is allowed by the local jurisdiction. If it is allowed, the owner should have the quality control requirements, required scope of services, and communication of results and documentation stated clearly in the specifications and contract documents. CMET consultants engaged to perform QA or QC services have no responsibility or right to accept or reject a constructor’s work or to stop construction activities. Instead, the constructor’s supervisory personnel, acting on their review of the work they have performed and review of the QA and QC firms observation and testing reports and within the framework of their QC plan, should take appropriate measures when issues arise. The International Building Code defines “Special Inspection” as “the required examination of the materials, installation, fabrication, erection, or placement of components and connections requiring special expertise to ensure compliance with approved construction documents and referenced standards.” Special Inspection requirements included in the construction documents are subject to procedures and processes established in the jurisdiction involved. The code requires that the owner or their representative—as opposed to a constructor—must pay for these services. Special Inspections are an additional part of the quality process, and performed in conjunction with an overall QA program to help confirm quality in the constructed project. In most jurisdictions, the Special Inspections for a project are performed by the CMET firm. QA and QC are both vital to the successful completion of a project. When clearly understood, they can complement one another and streamline the process. A CMET firm can become a trusted partner and advocate throughout the life of the project. Source for some of the information in this article: www.ASFE.org, The Geoprofessional Business Association.